Visitors of the Angkor Wat and other Angkor temples stay in hotels in Siem Reap. The four biggest and most famous temples, Angkor Wat, Angkor Thom's Bayon, jungle temple Ta Prohm, and Preah Khan, can be visited on a single day. If you like to see more temples, you need at least two full days, one for the Small Tour and one for the Grand Tour. More days can be spent in Roluos and Banteay Srei, Phnom Kulen, remote jungle temple Beng Mealea, Tonle Sap floating or stilt villages, hidden Angkor temples in the east and west; for a more intense exploration of Angkor Thom, or for museums and attractions of Siem Reap. Angkor Wat is the largest historical temple in the entire world, its stonemasonry and works of sculptural art are of excellent quality, some of them of record-breaking size, the five towers are the national emblem of Cambodia: However, Angkor Wat is only one of more than a dozen huge temples in Angkor. Another landmark of Angkor are giant carvings of Buddhist faces. 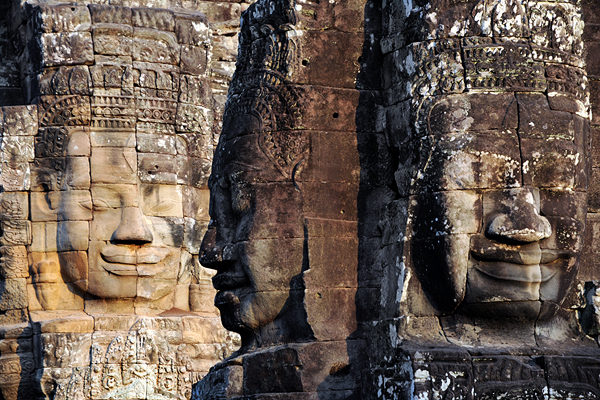 These face-towers characterize Angkor Thom, which was a city of nine square kilometres. Colossal faces can be seen at the towers of Angkor Thom’s five city gate and even more at the central temple called Bayon, which is also famous for its long gallery walls decorated with carvings. They show historical episodes and some nice small scenes from everyday life in the 12th century. 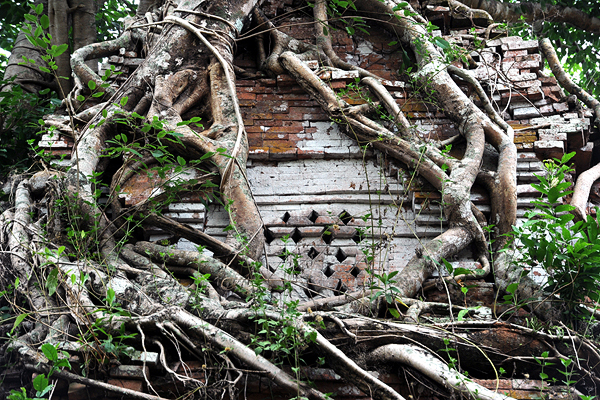 Furthermore, Angkor is famous for its overgrown temple ruins in the jungles. The "jungle temple" par excellence is the vast complex called Ta Prohm. It’s of the size of an entire medieval city in Europe. Roots of many huge strangler figs and tetrameles make this monument more exciting than any other temple ruins in the entire world. 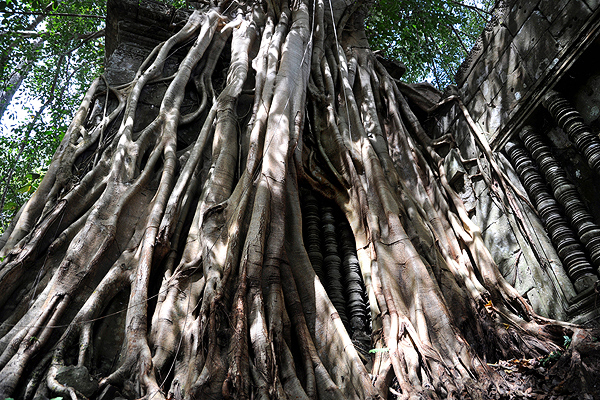 Some more stone-covering trees can be seen in similar flat temple complexes such as Preah Khan and Ta Som. The Angkor ticket is also valid in Roluos in 15 km distance from Siem Reap. On a half-day excursion you can visit all three significant Roluos monuments, namely Bakong pyramid and ancestor temples Preah Ko and Lolei. The morning is more recommendable than the afternoon. You can combine a visit of Roluos with a boat trip to the picturesque stilthouse village Kampong Phluk. 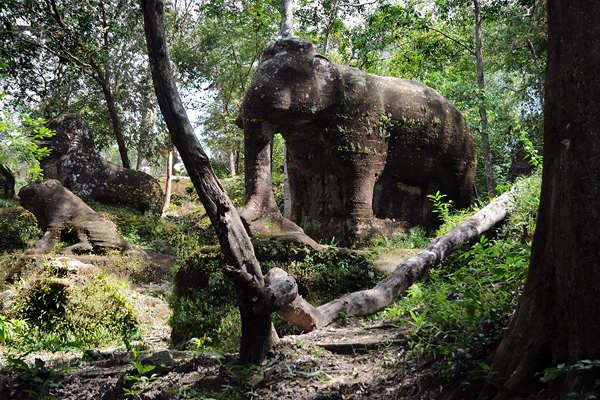 Another full-day option is a tour to Roluos and Beng Mealea. Roluos plus more eastern Angkor temples, Chau Say Vibol, Phnom Bok, and Banteay Samray, is a different daytrip. Roluos and Banteay Srei could be visited on a single day, too. 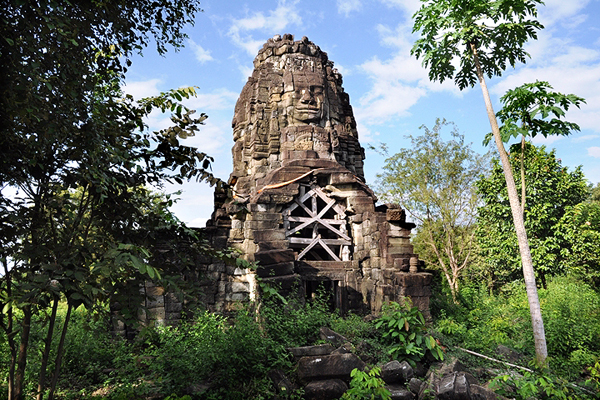 The Roluos Group is a collection of monuments from the late ninth century, older than those in Angkor. Roluos became a kind of prototype for Angkor. King Indravarman I was the founder of what can be seen in Roluos today. 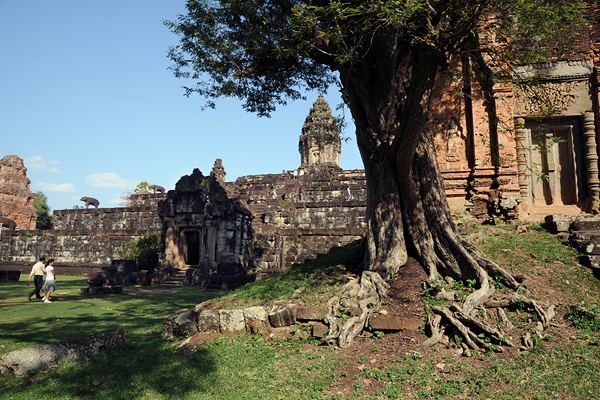 Preah Ko, giving its name to the art style of Indravarman's reign, is this king's ancestor temple belonging to his palace compound. The flat temple Preah Ko was dedicated in 879, three Prasats were for male and three more Prasats for female ancestors of the king. Preah Ko is famous for its lintel carvings that became exemplary for those of Angkor. Even more innovative is the step pyramid called Bakong, which was Indravarman's state temple, completed in 881. This is the oldest surviving Khmer monument forming an artificial mountain. It enshrined King Indravaman's palladium, the Linga Indreshvara. The Lolei temple, which is similar to Preah Ko, was completed under Indravarman's successor Yashovarman I, but the reservoir surrounding it had been begun already under Indravarman I. 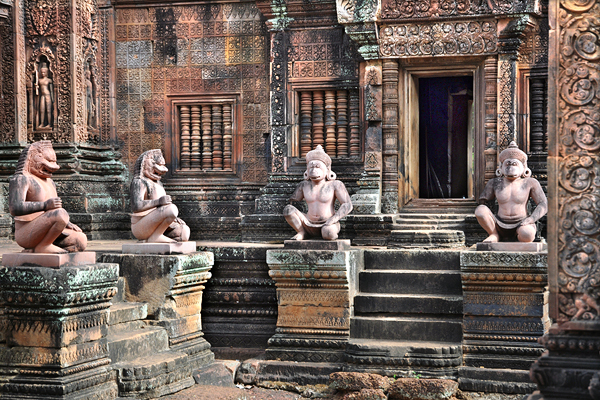 The Lintel carvings of Lolei Ko belong to the highlights of Khmer sculptural art. There are smaller structures in Roluos, rarely visited. Banteay Srei is in about 40 km driving distance from Siem Reap, this is why prices for tours to Banteay Srei are higher than those for Angkor, however, Banteay Srei is reachable by Tuktuk. The Angkor entry ticket is valid for Banteay Srei, too, it is also valid for the area of Kbal Spean with exceptional underwater carvings. So this is a good combination, as Kbal Spean is only in 10 km distance from Banteay Srei. On the way back is time enough to visit a private landmine museum and Banteay Samray, if you like. Alternatively, you could see some Phnom Kulen attractions with an additional ticket. Banteay Srei is famous for the elegance of its decorations. They are of exceptional refinement and almost unweathered, due to the use of the best sandstone quality available, its red tone contributes to the charming appearance of this small temple, which likes to be called "the gem of Khmer architecture". Most visitors consider Banteay Srei to be the most beautiful Khmer temple at all. Banteay Srei was founded in 967 and built during the reign of Jayavarman V. The king was still a minor, when this ambitious temple was built by the young king’s teacher and chief minister Yajnavaraha. Remarkably, the model for Banteay Srey's layout was Prasat Thom, the state temple of Koh Ker. Banteay Srei was also dedicated to Koh Ker's main deity called Tribhuvanamaheshvara, Shiva as the "Lord of the Three Worlds". The temple area can be divided into two zones, they are separated by an impressive moat. The inner enclosures, counted first and second, form the core temple on the island. The three main Prasats, dedicated to Shiva and Vishnu, and the two neighbouring buildings called libraries show the beautiful relief decoration mentioned above. The access road to Phnom Kulen is not passable for Tuktuks. You need a taxi or a motorbike to visit the plateau in about 50 km distance north-east of Siem Reap. A special ticket is required for this national park area not included in the Angkor ticket, the Phnom Kulen ticket is available in Siem Reap. Half a day or a little bit more is just enough for visiting the reclining Buddha and waterfalls and 1000 Lingas. You need a full day and motorbike service for seeing the rock-cut animal sculptures and the bats cave and one or two ancient temples on the Kulen mountain plateau additionally. Overnight stays in require special permissions. Phnom Kulen, "hill lychee", is an isolated sandstone plateau of about 25 km length and 10 km width. It is a holy mountain for Cambodians, they regard it as the birthplace of the ancient Khmer Empire. King Jayavarman II is said to have declared independence from Java here in 802. He called himself "Chakravartin", which is an Indian title for emperor. There are many ruins of brickstone temples on Phnom Kulen. Most of them are from the first half or middle of the ninth century. They are in a style that is considered to be transitional, between pre-Angkorian and early-Angkorian. There are signs of Javanese influence. However, some Cham examples have played a more important role. Close to the main car park is a stream bed called "1000 Lingas" with more than 1000 small depictions of Lingams carved into the sandstone, 5 cm below the water surface. The Buddhist monastery is called Preah Ang Thom is the major pilgrim site on Phnom Kulen. The object of veneration is an 8 m long reclining Buddha, the largest rock-cut scuplture in Cambodia. It is from the 16th centuryThe main waterfalls of Phnom Kulen are 20 m high. They are within walking distance. 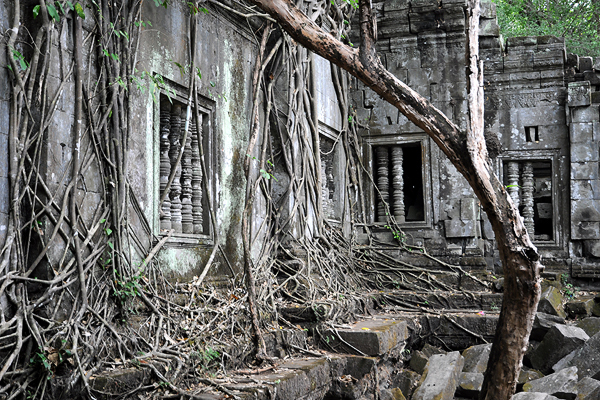 Beng Mealea is located 60 km east of Angkor. You can reach it after about 90 minutes driving on a half-day excursion. A ticket will be issued at the main car park, entry fee is 10 US Dollars. You could also visit Beng Mealea on the way from Siem Reap to Phnom Penh, investing 2 or 3 hours for the detour and the visit. If you drive back to Siem Reap, you could visit Roluos or Chau Say Vibol on the way or you could enjoy a boat trip to Kampong Phluk near Roluos. The largest stilt village is Kampong Khleang, it's farer from Siem Reap but closer to Beng Mealea than Kampong Phluk. Kampong Khleang plus Beng Mealea are a perfect day. Beng Mealea means "lotus pond". Most visitors will fall in love and never forget this jungle temple par excellence. Its trees are not as huge as those of Angkor's jungle-temple Ta Prohm, but there are many more trees covering the buildings in Beng Melea: The whole vast temple is a forest. Beng Melea's temple enclosure is 181 m long and 152 m wide. The moat once enclosing the vast area of this temple town is now partially dried up. It measures 1025 m by 875m and is 45m wide. The foundation date of the temple is not reported in inscriptions. Stylistically Beng Melea is ascribed to the classical Angkor Wat period in the first half of the 12th century. The ground plan of Beng Mealea, which is mostly built of sandstone, is very similar to that of Angkor Wat. But it is not sure whether it served as a blueprint for the Angkor Wat or was a later copy. In contrast to Angkor Wat, Beng Melea is a flat temple and hat not five towers in the inner enclosure, but only one. Beng Melea is famous for beautiful carvings, too. They show legends of Vishnu, Shiva and the Buddha as well. They include episodes from the Ramayana, e.g. the Agnipariksha, Sita's fire ordeal to prove her innocence. 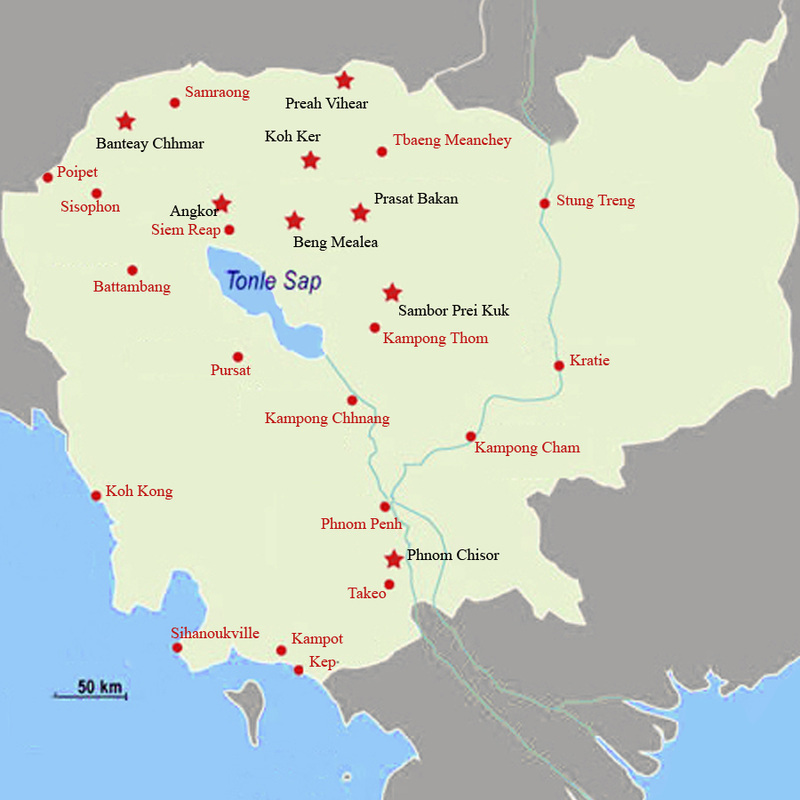 Koh Ker in Preah Vihear Province is located in one of the poorest and most remote regions of Cambodia. The road from Siem Reap to Koh Ker is 110 km long, but partly in a bad condition. This is why you need up to 4 hours for one way. Visitors need a separate ticket available at the begin of the excavation area or also at Beng Mealea. The entry fee is 10 US Dollars. All important temples are located close to a ring road in Koh Ker, easy to find and safe. Landmines were cleared with international support. For seeing all the major temple complexes described on this website you need at least 3 hours. Koh Ker was briefly the Khmer capital during the reign of Jayavarman IV (928-942 CE), who was the principal in this area alrready before he seized the throne of the Khmer empire. After succeding his rival Ishanavarman II in Angkor, Jayavarman IV decided to continue to reside in Koh Ker. This is why it became the capital. Those days it was called Chok Gargyar "Island of Glory" and Lingapura "Phallus-city". During the reign Jayavarman's son Harshavarman II the elites in Angkor managed to gain the upper hand again, and Rajendravarman II finally shifted the capital back to Angkor in 944. Almost all monuments in Koh Ker were erected by Jayavarman IV, most of them even before he became king of the empire. Principal structure of Koh Ker is Prasat Thom, its remarkable procession alley connects two structures, the enlarged gate Prasat Krahom and an ensemble of nine Prasat towers surrounded by an impressive moat. This layout is not the usual concentric one, it is linear. The lovely temple of Banteay Srei copied it. Koh Ker's landmark is Prasat Prang, a 35 m high sandstone pyramid with seven levels. It is integrated into the linear layout of Prasat Thom. Other temples are located along a ring road in the large excavation area. The Preah Vihear Temple is usually safe for visitors, despite warnings of ministries for foreign affairs of western states. Access would be denied for tourists in case the border conflict with Thailand flared up again. The road from Siem Reap via Anlong Veng to Preah Vihear Temple is 220 km long and in a good condition. If you have no other choice it is possible to travel up and down on only one day, you need more than 12 hours for this excursion. It is much more recommendable to have an overnight stay in Sra Em near Preah Vihear, allowing you to visit the temple in the morning or late afternoon instead of noon, and seeing Koh Ker on the way. Preah Vihear Temple was declared a UNESCO World Heritage Site in 2008: The temple is famous for the beauty of its architecture and its setting as well. The 800 m long complex is spectacularly situated atop the 525m high cliff Pey Tadi in the Dangrek mountains. The temple was dedicated to Shiva in his manifestations as local mountain gods Shikhareshvara and Bhadreshvara. Preah Vihear is the most significant example of a Khmer temple with a linear instead o a concentric layout. Each of five Gopuram gateways on ascending levels of the hill is of the size of a whole temple.Most parts of the complex are ascribed to King Suryavarman I in the first half of the eleventh century. Some surviving parts are from earlier periods. The oldest stone structure is the exterior Gopuram gateway, counted fifth. It is from the Koh Ker period in the first half of the 10th century. The third Gopuram is the largest single building of Preah Vihear. The very prestigious three-wing complex of this Gopuram is believed to have been the king's residence when he came to pay homage to Shiva.The central sanctum enshrined the Lingam Bhadreshvara. The principal court is flanked by two separate complexes with own courtyards. Preah Khan Kampong Svay is situated in a very lonesome forested and rural area east of Angkor. The direct road from Siem Reap, which is under reconstruction between Beng Mealea and Preah Khan, is 150 km long. The main road via Kampong Thom is 250 km long. Driving up and down from Siem Reap is possible within one day only if you are ready to start not after 7.00 am and return after nightfall. Simple Accommodation is available in about 40 km distance at National Road 62, halfway between Kampong Thom and Preah Vihear City. It is recommandable to stay one night in Kampong Thom and to visit Sambor Prei Kuk, too. Prasat Bakan is the local name of Preah Khan at Kampong Svay in Preah Vihear Province, not to be confused with Preah Khan at Angkor in Siem Reap Province.Though one of the five largest Angkorian complexes in Cambodia, Prasat Bakan is rarely visited. It offers the best opportunity for a "lost temple in the jungle" experience. Considering the extension of its outer enclosure walls Prasat Bakan is the largest Khmer monument, 4.5 km long and 4.2 km wide. Prasat Bakan was founded by Suryavarman I (1006-1050), to whom most of the remaining stone structures are attributed, though some are later additions from the 12th century. Before becoming king, Jayavarman VII used Prasat Bakan as a rebel stronghold during the time of Angkor's occupation by Cham invaders. After defeating the Cham forces he ascended the throne in Angkor in 1181. The first monument on the right side is a 15 metres high pyramid called Preah Damrei or Prasat Damrei. Inside the enclosure wall, Preah Stung has a facetower in the centre its the courtyard, making Prasat Bakan one of only two facetower-temples outside Angkor. The compound of Prasat Bakan's central temple is almost as large as that of Angkor Wat. The temple town Sambor Prei Kuk is situated at the river Sen, 30 km north-east of the provincial capital Kampong Thom, where different kinds of accommodation are available. The side road to Sambor Prei Kuk is not sealed. Good maps of the excavation area are positioned in Sambor Prei Kuk, but some smaller temples are a little bit hidden. It makes sense to visit Sambor Prei Kuk on a Cambodia round tour, when you travel on National Highway 6 between Siem Reap and Phnom Penh. Without breaks you would need about 5 or 6 hours, for a side trip to Sambor Prei Kuk and exploring the temple town you need 3 hours more. Sambor Prei Kuk is the most ancient temple town in Southeast Asia that and the most prominent excavation area from the pre-Angkorian Chenla period. The city was conquered and most of its stone monuments were established by Ishanavarman I. Sambor Prei Kuk has 150 structures in an area of 300 hectare size, 47 of them were Prasats of the 7th century. The buildings are divided into three larger and one smaller group, the latter called "Z". "N" is the North Group, "C" the Central Group and "S" the South Group. The South Group was main sanctuary under King Ishanavarman I, inscriptions mention him as the founder. In Khmer architecture, octagonal temples are unique to Sambor Prei Kuk. A characteristic decorational element of Sambor Prei Kuk's monuments are so-called "flying temples", very detailed stone carvings depicting whole temples at the outer walls of Prasat towers. 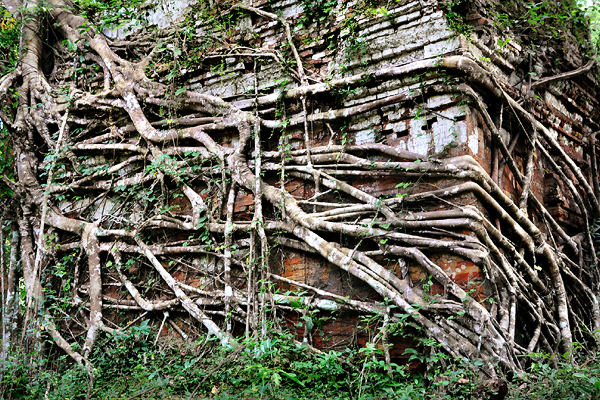 Two structures of the North Group located even further north (on the other side of today's access road and car park) are of special interest for tourists: Prasat Chrey (N18) and Prasat Luong Chom Bok (N24) are completely covered with roots of strangler figs, making Sambor Prei Kuk a place deserving the title "jungle temple". Banteay Chhmar in the very north-west of the country is situated very close to the Thai border, but the nearest crossing point is Poipet. Banteay Chhmar is 160 km away from Siem Reap, it can be reached via National Highway 6 to Sisophone, the road from this provincial capital to the remote Banteay Chhmar is much better now than several years ago. We can drive up and down within one day. However, it is more recommendable to have an overnight stay in Banteay Chhmar, where simple accommodation is available. 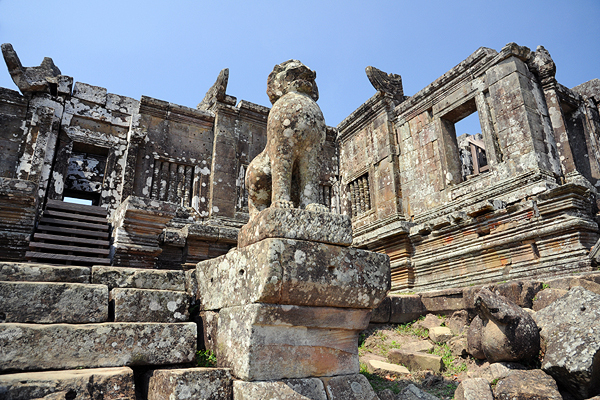 A tour with two overnight stays can include Preah Vihear and Koh Ker additionally. Banteay Chhmar is a modern Khmer name meaning "narrow castle". Concerning the mass of stones that had to be moved, Banteay Chhmar is the second biggest Khmer monument, Angkor Wat is the biggest, of course. Banteay Chhmar is one of many temples in the Bayon style of Jayavarman VII (1181–ca. 1218), who introduced Buddhism as state cult and founded Angkor Thom. Similar to Angkor Thom’s central temple Bayon, Banteay Chhmar has long gallery walls with carvings depicting parading troups, battles, mythology and scenes of daily Khmer life. Two multi-armed Lokeshvara-carvings at the western wall are landmarks of Banteay Chhmar. There is another striking similarity: No other temple complex outside Angkor Thom has more Buddhist facetowers than Banteay Chhmar. Banteay Chhmar was erected on a site of an earlier Hindu sanctuary attributed to Jayavarman II, who is believed to be the founder of the Khmer empire in 802.Banteay Chhmar's central shrine once held an image of the crown prince. Four supporters of him are venerated, too, because they sacrificed their lives for the prince.